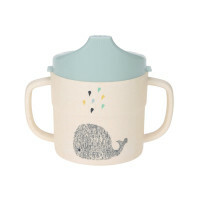 LÄSSIG’s sippy cup with the little whale scores with its functionality, loving design and sustainable materials. The mug is dishwasher-safe and perfect for children from 6 months and up. 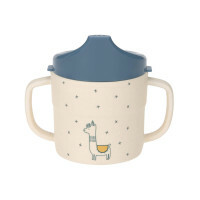 Product information "Sippy Cup with Bamboo, Little Water Whale"
description & equipment With LÄSSIG’s Little Water baby collection’s sippy cup a baby’s thirst is quickly quenched. The handles on both sides provide a secure and safe grip during drinking and thanks to the practical lid with a drink opening, nothing can spill. 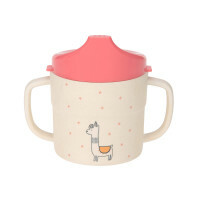 In love with nature: This sippy cup is dishwasher-safe and like the other bamboo tableware items, is made mainly from the renewable and sustainable raw materials bamboo and corn and includes a certain amount of melamine. Perfectly suitable for children from 6 months and up. With the magical swan and the little whale, learning to drink is even more fun.